Honda steps up with an all-new, 249.5cc, DOHC engine and a chassis that mimics the superb-handling CRF450R. 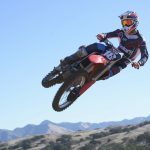 Does the 2018 CRF250R have the goods to become the 250cc motocross class champion? 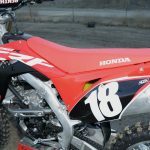 When Honda unveiled its all-new quarter-liter motocross contender last July, the 2018 Honda CRF250R featured a twist that even the 2018 Honda CRF450R can’t claim – an all-new, DOHC, dual exhaust port engine. 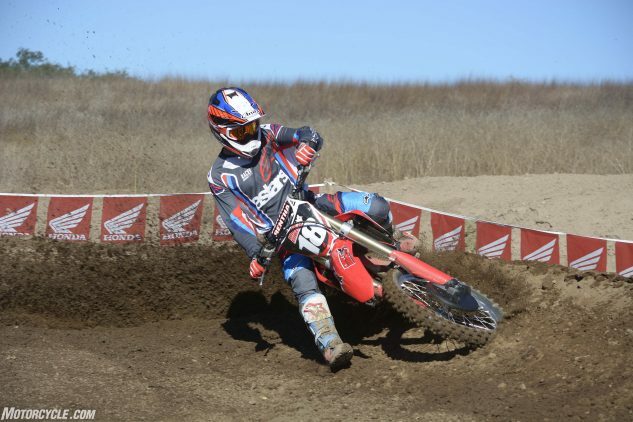 Naturally, we were dying to swing a leg over the new machine and see for ourselves whether it has the goods to reclaim the top spot in the 250cc motocross hierarchy. 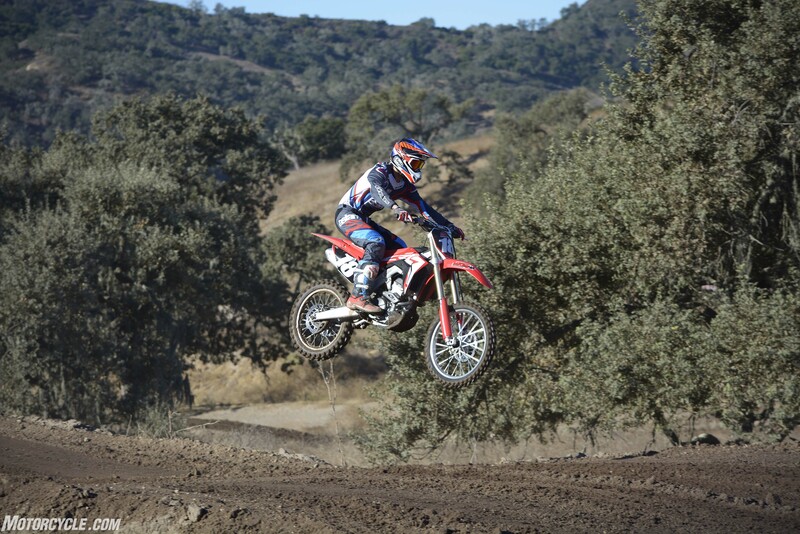 That day finally came at Zaca Station, near Buellton, California, where Honda invited us to come and experience the 2018 CRF250R for ourselves. Coincidentally, Honda finally announced the MSRP for the new 250R, which will be available in dealer showrooms this December for $7,999. We were excited when we first saw the 2018 CRF250R, and now that we’ve spent some time aboard it, we are impressed, although not exactly the way that we thought we would be. Firing up the 2018 CRF250R is a snap now, because the all-new CRF250R boasts electric start as a standard feature. Even from the first few blips of the throttle, we could tell that the throttle response is smooth. 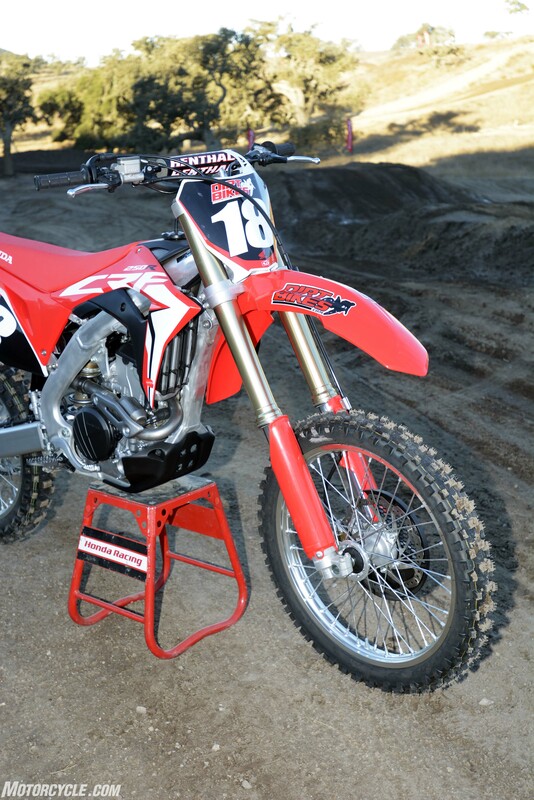 Fueling is handled by Honda’s PGM-FI fuel-injection through a 46mm Keihin throttle body, which is the same size as last year’s unit, but the 2018 CRF250R gets the downdraft intake layout that Honda used on the 2017 CRF450R, giving the incoming air/fuel charge a straighter shot into the 250R’s new cylinder head. 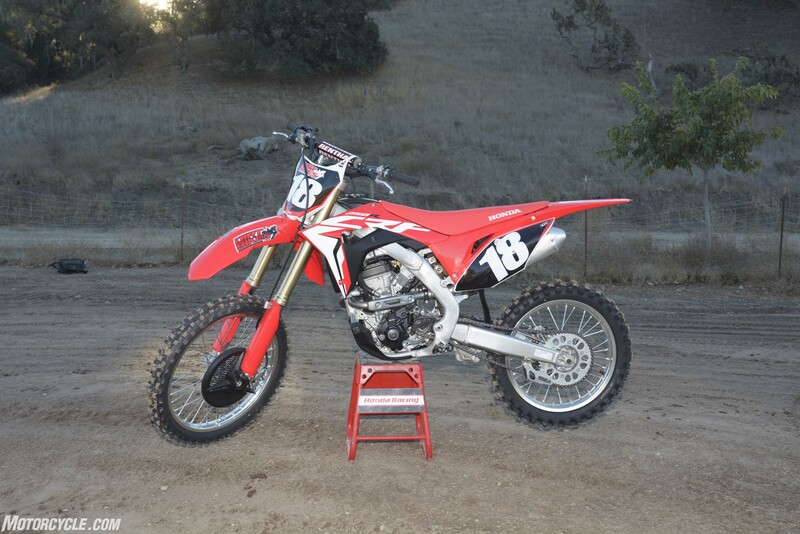 The 2018 CRF250R’s chassis is derived from the 2017 Honda CRF450R. The two bikes share the same geometry specs. Zaca Station features deep, loamy soil that can quickly reveal whether or not a motocross bike is in the game when it comes to power output, and were pleased to find that the 2018 CRF250R has more than enough to generate plenty of excitement on the track’s long, flowing layout. If there’s one word that best describes the Honda’s new 249.5cc DOHC engine character, it’s smooth, and we mean really smooth. 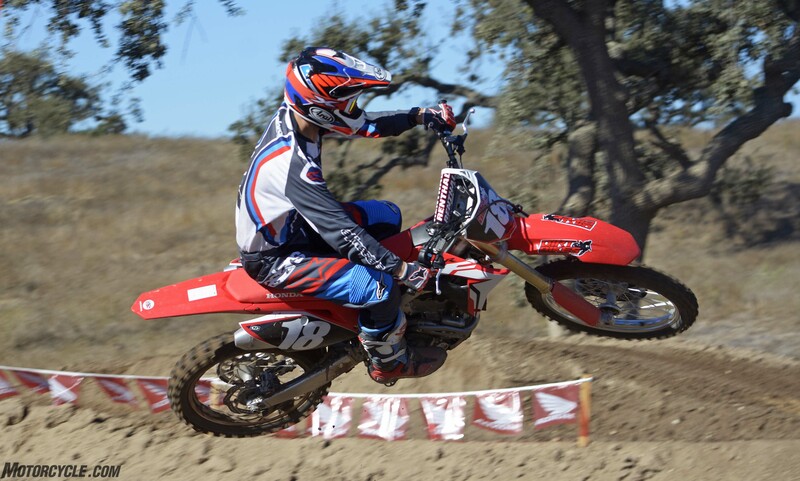 Both DirtBikes.com lead test rider Ryan Abbatoye and our Vet Novice tester agreed that the new engine boasts a seamless power delivery from idle on up to its 14,400 rpm redline, which is set 900 rpm higher than the 2017 Honda CRF250R. 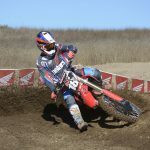 DirtBikes.com lead test rider Ryan Abbatoye churns and burns Zaca Station MX’s loamy ground on the all-new 2018 Honda CRF250R. The DOHC 250 boasts a linear power curve that makes it deceptively fast. That’s a good thing because you’ll need it. For while the 2018 Honda CRF250R is smooth, it isn’t punchy anywhere in the rev range. 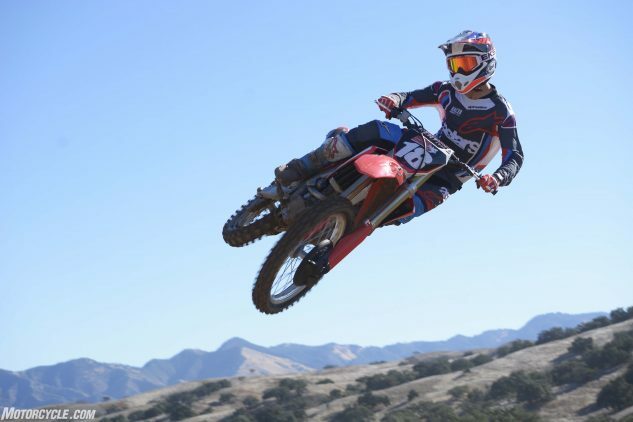 Our laps on the Zaca Station track revealed that the 2018 model’s linear thrust makes it easy to ride fast, but at the same time you don’t feel like you’re really motivating. The meat of the power is concentrated toward the upper rpm, and the CRF is extremely subtle in its overall delivery as it transitions from bottom to top. There’s no real lunge anywhere in the rev range, so the perception is that the bike is slow when the reality is quite different. 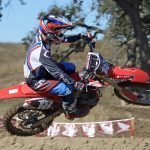 Honda had a 2017 CRF250R on hand for comparison’s sake, and we were surprised to recall just now much low-end torque the Unicam engine has in the lower rev range, which makes it a lot of fun to grunt off corners. However, the 2017 also falls flat as it moves through the mid-range and into its upper-end hook. That’s where the 2018’s DOHC engine is really superior, serving up a silky delivery with a lot more overrev. It’s our take that the new engine’s power curve shares a lot more in common with the KTM 250 SX-F or the Husqvarna FC 250 – or both of those manufacturers’ 350cc models – than any other Japanese 250cc motocrosser we’ve sampled. A larger bore and shorter stroke help to give the Honda’s 249.5cc four-single a rev ceiling of 14,400 rpm – 900 revs more than the Unicam engine it replaces. Like the dual cams, the dual exhaust port cylinder head is a first for the CRF250R. 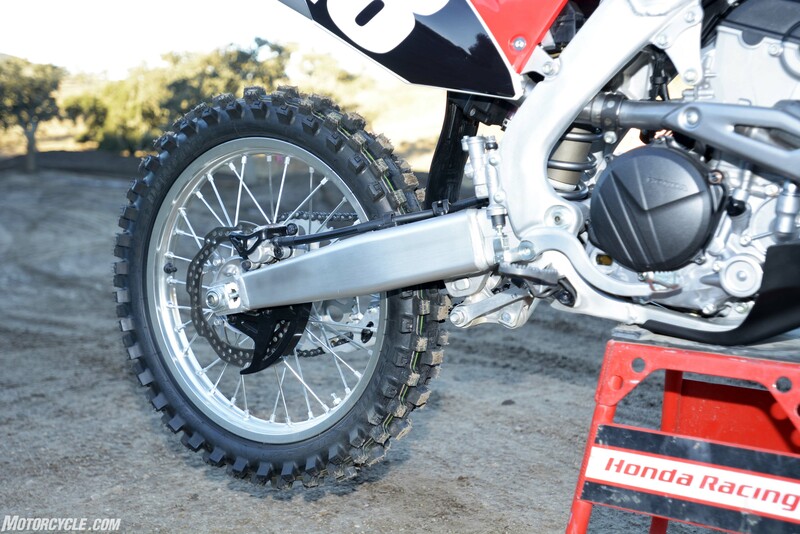 No surprise, really, since the 2018 Honda CRF250R features a larger 79mm bore and shorter 50.9mm stroke compare to the 2017’s 76.mm x 53.8mm dimensions. That isn’t all that helps the 2018 model rev more freely than the 2017. The 2018’s new cylinder is offset 5mm closer to the crank centerline than the 2017’s 4mm offset, freeing up drag by reducing piston to cylinder wall side thrust. The 2018’s crankshaft is also 350 grams lighter thanks to a new H-shape cross section that reduces mass. Up top, the new cylinder head is also clearly designed for greater high rpm power. Its included angle is 1 degree narrower – 20.5 degrees – and its titanium 33mm intake and 26mm exhaust valves are larger than the 2017’s. The 2018’s dual camshafts also create more valve lift on both the intake and exhaust sides, and Honda’s F1-style finger-follower rocker arms allow for more radical, high-rpm-oriented cam timing while maintaining good valvetrain stability. 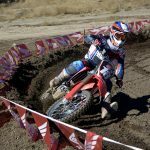 Yep, the 2018 Honda CRF250R sports a top-end woosh that should be a windfall for riders who like to ride in a lower gear and keep the throttle pinned to make the most of the 2018 CRF250R’s rpm potential, but point-and-shoot Honda riders who were expecting the low-end lunge of the old Unicam engine combined with a more ferocious mid-range and a shrieking top-end might not be so jazzed at first. Even after trying all three of the available maps programmed into the Honda’s handlebar-mounted Power Mode Select system, we were looking for a little more off the bottom than the new engine offers. 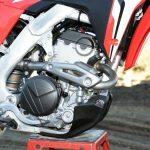 Thus, the key to riding the 2018 CRF250R fast is to work the 2018’s light and linear clutch and keep the revs high, holding each gear for as long as possible. The new clutch can take it, as it features clutch plates that use two friction materials instead of one for greater durability. 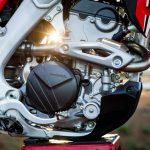 The gear ratios in the 2018 Honda CRF250R transmission are also completely different than the 2017 CRF250R, and they’re perfectly matched to the Honda’s new engine output. 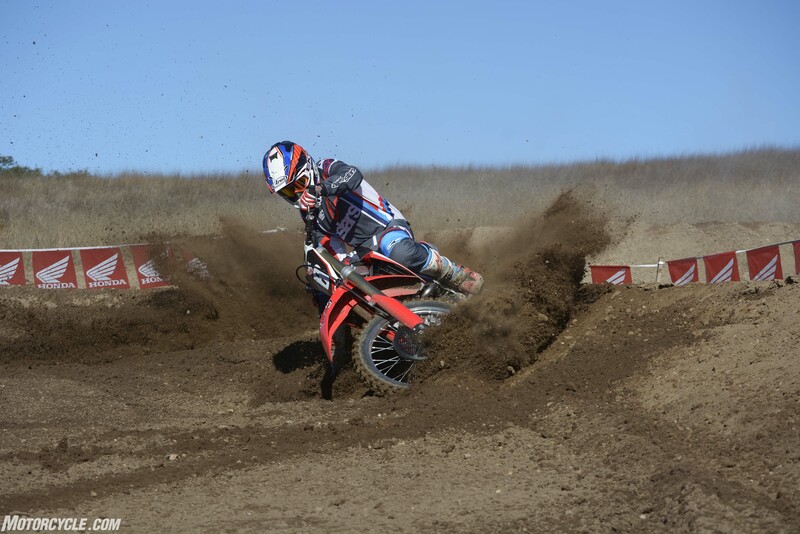 Even though the new Honda prefers to be held in each gear longer and revved to the moon, shifting is silky and smooth, typical of Honda motocrossers. 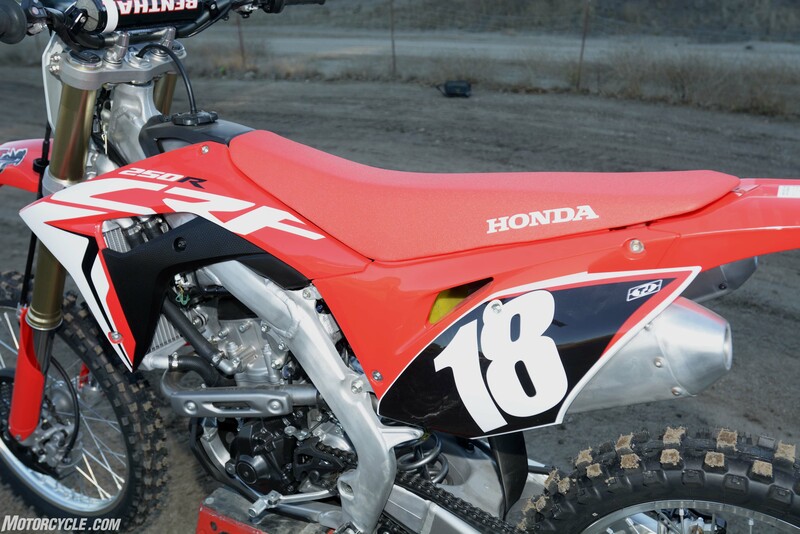 While the 2018 Honda CRF250R lacks the low-end grunt of its predecessor, it more than makes up for it with high-rpm power. That said, we’d recommend adding a tooth or two to the rear sprocket. 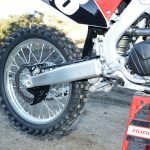 And there may be a quick and easy fix to give the 2018 CRF250R a little more thrust off of corners: A quick look at the 2018 CRF’s rear sprocket revealed that 2018 Honda is fitted with a 48-tooth rear sprocket, whereas the 2017 model features a 49-tooth rear. 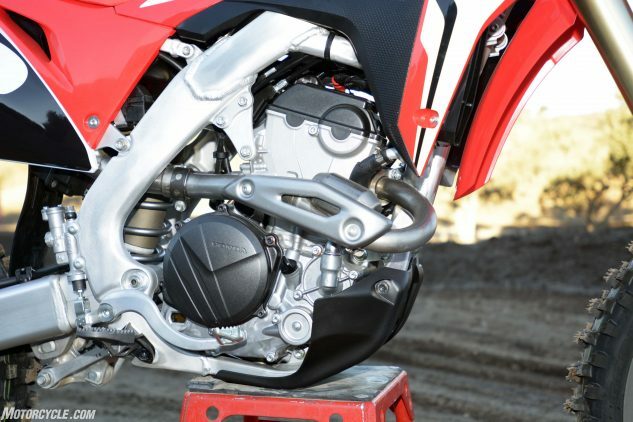 Our two-man test crew is convinced that going to a 49-tooth or even a 50-tooth rear sprocket could really help the 2018 CRF to feel more potent off of slow corners without hampering its ability to churn out its high-rpm performance goodness. 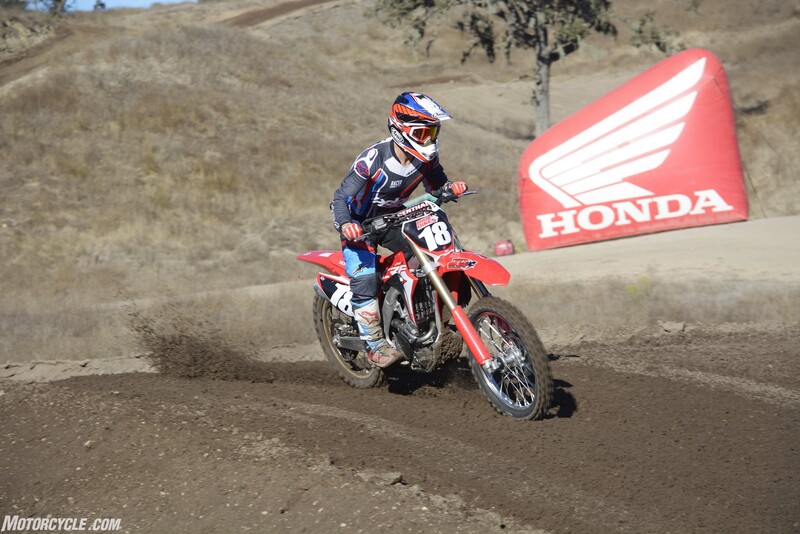 We did notice that GEICO Honda rider Jo Shinoda had a 49-tooth rear sprocket on his personal 2018 Honda CRF250R, so we can’t be too far off in our guesstimation that steeper gearing will add some snap to the new DOHC engine. But whether you like the creamy output of the 2018 Honda CRF250R or not, it’s hard to fault the ’18’s CRF450R-derived chassis and Showa suspension. 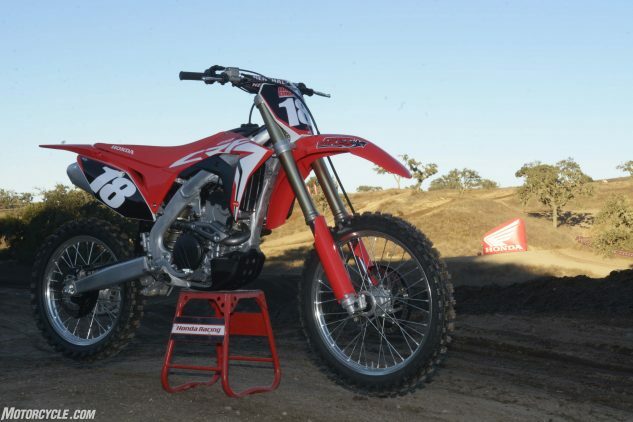 The chassis geometry of the 2018 CRF250R is identical to that of the CRF450R – only the lower part of the frame is different to accommodate the 250’s dual headpipes. 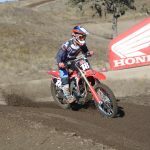 Honda’s Absolute Holeshot performance goals really shine through in the 250’s handling, which is arrow-stable at high speed. After minimal suspension sorting, the new CRF’s 58.3-inch wheelbase chassis exhibits zero headshake, and yet it is also much improved in the corners. Abbatoye was very pleased with the 2018’s ability to carve tight line, rail outside berms and happily switch from one to the other with minimal steering effort. The Honda’s suspension imparts a plush feel with excellent bump absorption at both ends. The 2018’s rake is slightly more relaxed, 27.5 degrees than the 27.4 degrees of the 2017 chassis, but its 116mm trail is 2mm shorter than the 2017 as well. Regardless of the numbers, the 2018 CRF250R rewards the rider by staying in line and digging with a authority both into and out of corners. There seems to be no end to how hard you can push it in grippy loam like we had at Zaca, but our sense is that, like the CRF450R, the CRF250R will be just as competent in dry, slick conditions. Front-end feedback is excellent, and the rear end tracks straight and true in situations that left the 2017 CRF250R breaking its rear end loose. The 2018 is simply more efficient at driving forward, and that can equate to incrementally better split times that add up to quicker lap times. Even though it weighs more than some current 450cc motocross machines, the 2018 CRF250R doesn’t feel heavy. The Honda is very neutral and flickable in the air. 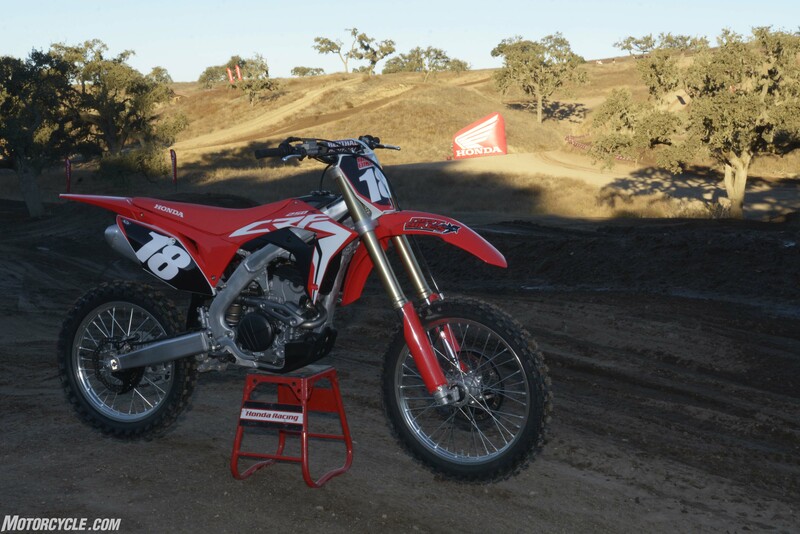 It’s a bit of a surprise to us, that even with its titanium 1.6-gallon fuel tank, the 2018 CRF250R’s 238-lb. claimed curb weight is about 4 lbs. 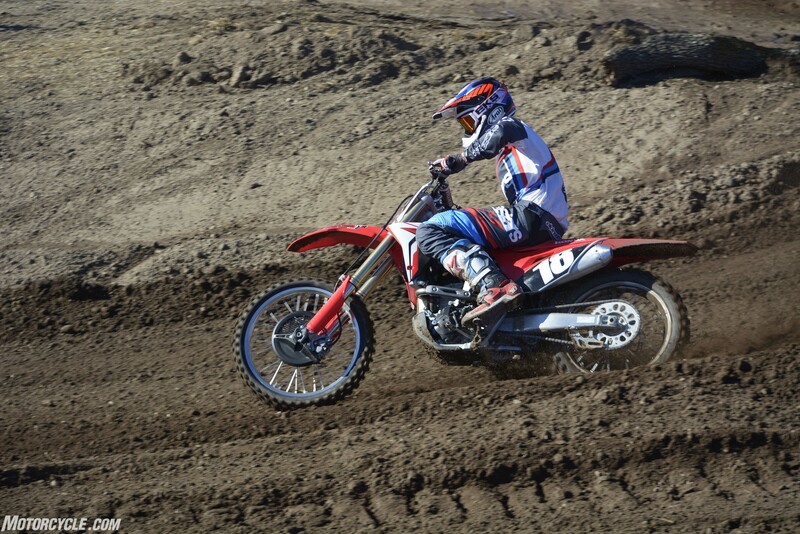 heavier than KTM’s 450 SX-F, and yet the CRF250R doesn’t feel heavy. Honda engineers have clearly infused the slim and low center of gravity feel of the ’17/’18 CRF450R into the 250 in a lot of ways. Just like its big sister, the 250’s rear frame section places the shock absorber 39mm lower in the chassis than before for better mass centralization, and its new, lighter, extruded aluminum subframe and shorter, narrower swingarm help shave weight while making the 250R feel more compact. 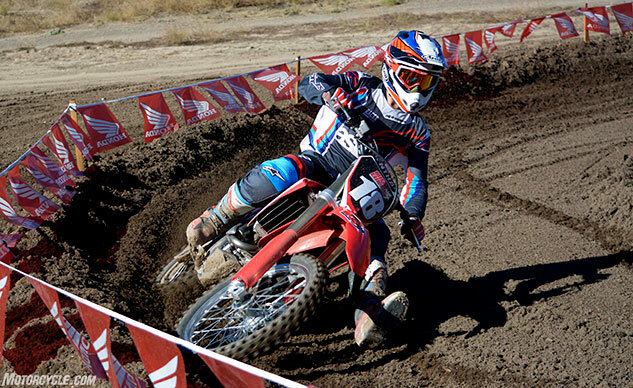 On the track, the CRF250R’s ergos are every bit as comfy as the CRF450R’s. The cockpit is slim yet roomy, and the CRF’s narrower main spars and tucked-in radiator shrouds stay out of the way of the rider’s legs. 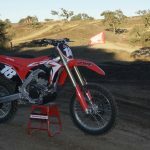 The 2018 Honda CRF250R brings an end to the air-fork era in production Honda motocrossers for now. Its fully adjustable 49mm Showa coil-spring fork boasts production-spec internals derived from Showa’s A-Kit race suspension. Front suspension travel is a plush 12 inches. And when it comes to suspension performance, the 2018 Honda CRF250R is light years ahead of its 2017 sibling. 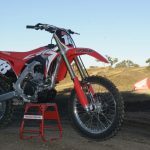 Honda ditched the previous model’s 49mm Showa SFF-Air fork and replaced it with the same 49mm Showa SPG coil-spring fork used on the current CRF450R, boasting a production-friendly version of Showa’s A-Kit race suspension internals. Yahoo! 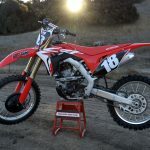 Out back, Honda’s latest Showa shock tames the bumps through the company’s trademark Prolink rear suspension linkage The 250’s front and rear springs are slightly lighter than the 450s, and valving at both ends is optimized for the CRF250R. 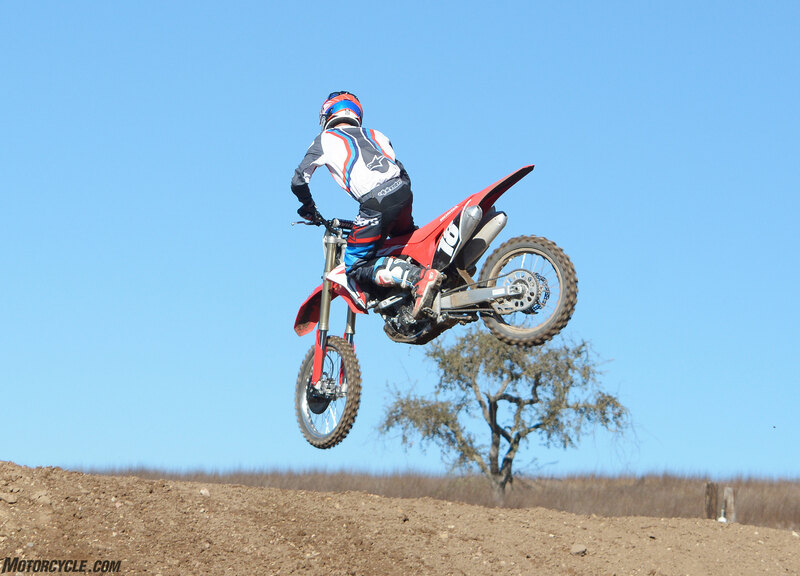 At Zaca Station, the 2018 Honda CRF250R proved that it will be a contender for best 250cc motocross suspension by soaking up the bumps and ruts in the loamy track with serious competence. Heck, our Vet even marveled at just how forgiving it can be in soaking up super big hits when he came up about three feet short on the track’s largest uphill double. 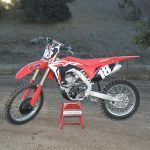 Although the CRF bottomed hard, its 12 inches of front travel and 12.4 inches of rear travel helped to maintain control, quelling what felt like certain doom. Abbatoye pounded the suspension all day and pronounced it excellent. 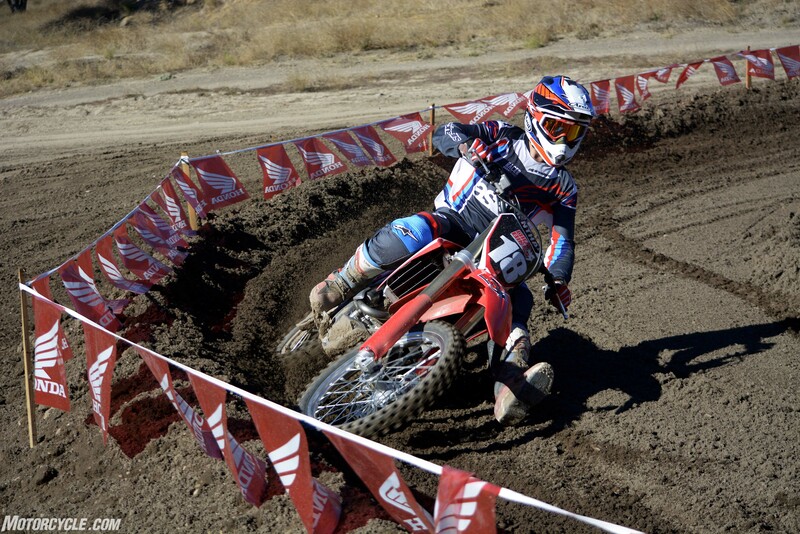 All it took was careful dialing-in of the rear sag and then slowing down the front rebound to get the CRF to behave over large and small bumps and jumps. Just about anyone should be able to find happiness with the 2018 CRF250R’s suspension. 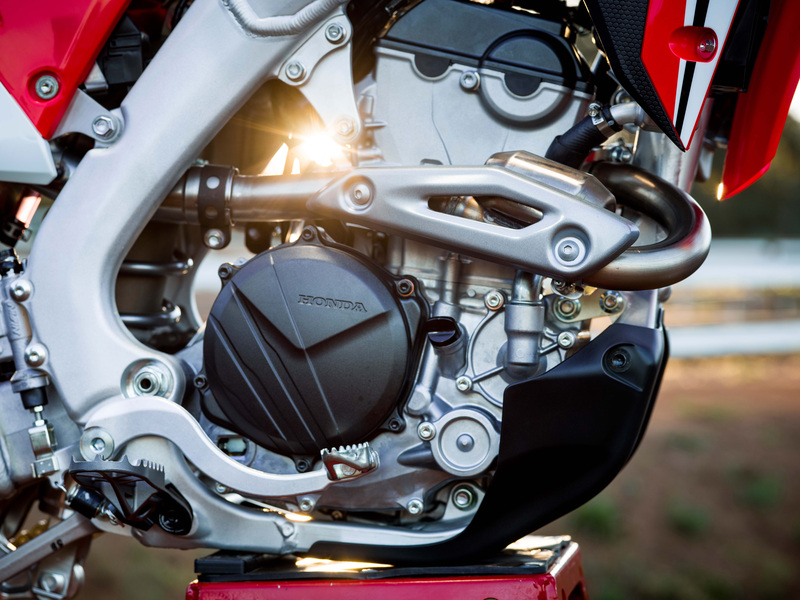 While the 2018 Honda CRF250R doesn’t feature a 270mm front brake, its 260mm front and 240mm rear units deliver plenty of stopping power and excellent modulation at both ends. 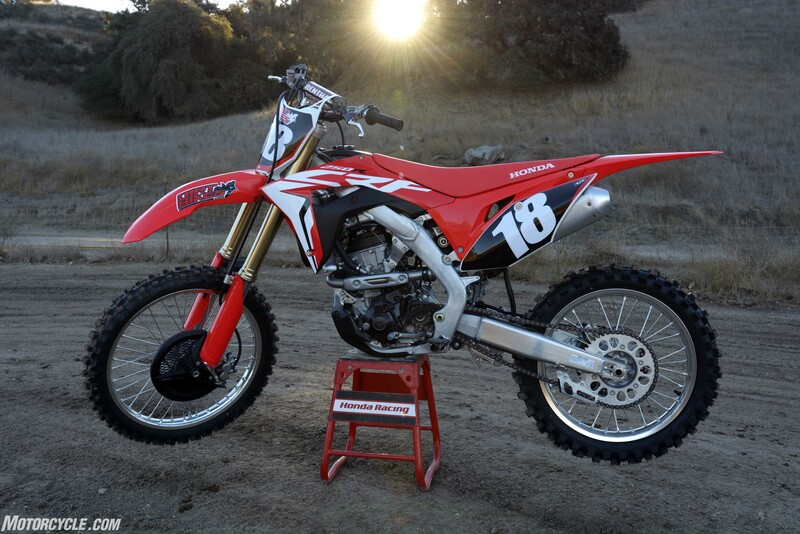 It’s also worth noting that the CRF250R’s Dunlop Geomax MX3S 80/100-21 front and 120/90-19 rear tires – pretty much standard fare on most serious motocross bikes these days – delivered excellent traction. 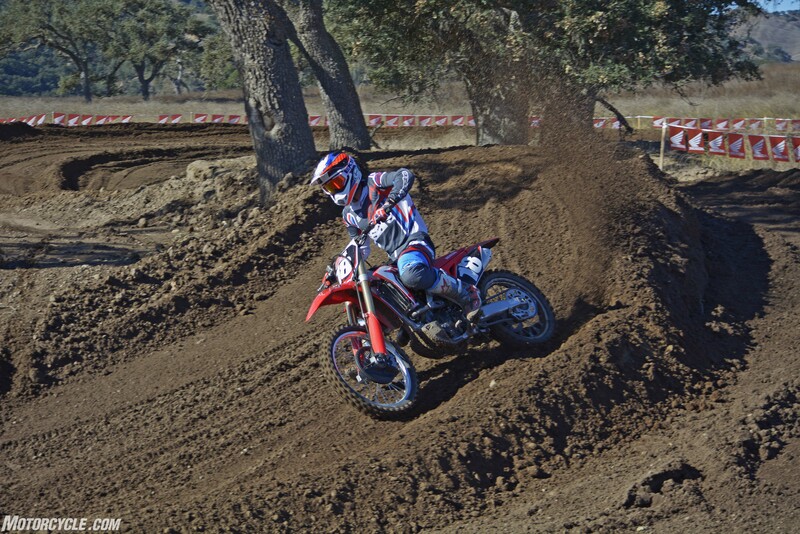 The CRF’s chassis delivers light steering manners and tremendous precision in the corners while remaining arrow-stable at high speeds in a straight line. 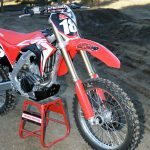 The bottom line here is that we expect to see a bunch of 2018 Honda CRF250R owners happily motoring around our local motocross tracks this season. We won’t surprised to see them with slightly larger rear sprockets and maybe even aftermarket exhaust systems, but we’re going to see lots of them. The only question left in our minds is how the stock package will stack up against the other 2018-model 250cc four-stroke motocross bikes. The CRF250R is much improved over the previous version, and we expect to be contender in 2018. It’s smooth and refined nature might even score a surprise knockout in the class. Time will tell.